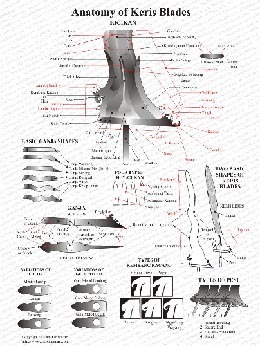 We are offering two beautiful laminated charts for free, for every purchase of a keris from this section of our site. These charts provide details of the "ricikan" or the physical characteristics of kerises and their various components such as the "warangka" or sheath, the ganja, pesi, mendak, hulu, etc. We have striven to produce them as accurately as possible by carefully researching and comparing the analyses of several sources and authorities on the subject. 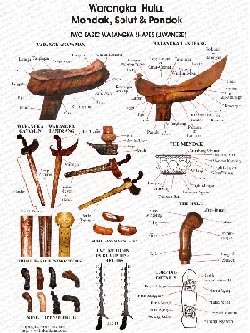 The charts are helpful references for keris collectors and scholars and they are laminated for protection against wear and tear so that they would last a life-time. These charts come in A4 sizes. Get to know more about kerises with the help of these charts!